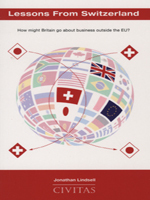 Lessons from Switzerland: How might Britain go about business outside the EU? Should Britain choose to quit the European Union it would take back from Brussels responsibility for negotiating its own trade deals with economies around the world. Some see this as a threat, fearful that the UK alone would never have the leverage to thrash out the kind of arrangements that the EU does. Others see this is an opportunity, freeing Britain to pursue deals on its own terms and with major blocs like China, the US and South America with which the EU - riven with competing internal demands - is yet to reach any agreements at all. In this study, Civitas research fellow Jonathan Lindsell takes a look at how Switzerland has fared as a European nation outside the EU. With an economy much smaller than Britain's, not to mention the EU's, it has hammered out trade agreements with an impressive array of global partners. But what kind of terms is it able to extract? Putting under the microscope the deal Swiss negotiators struck with Japan, the world's third largest economy and one with which Brussels still has no trade agreement, Lindsell finds that there is much to be said for the Swiss approach and how Britain too might go about business outside the EU.